Ticona GmbH is a producer of high-performance plastics. It closely supports customers in a large number of key markets customers during their engineering design process. 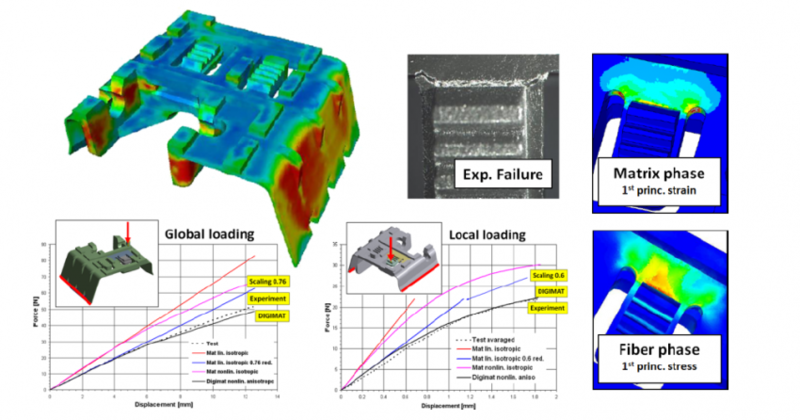 Before implementing material simulation, they faced challenges with correctly modeling fiber reinforced plastic parts, obtaining quantitative and predictive results from FEA, and using a unique material description valid for all kind of different load cases. • Calibration of an elastoplastic micromechanical simulation software model based on dumbbells from a plate cut 0° and 90° with respect to highly oriented fibers. • Setup of two different load cases (global & local) with different isotropic approaches and via material modeling and simulation software multi-scale modeling. With the scaling approach two different factors have to be applied to match the experimental force- displacement curve of the global and local load case. At the end of the process, only the micromechanical simulation software model, Digimat, correctly describes both load cases based on one unique material model, taking into account fiber orientations predicted by injection molding simulation.